Do You Need or Looking For A Reliable Locksmith? Do you know or have heard of locksmith charging $400+ for simple house lockouts? Are you worried you may hire untrustworthy locksmith? When someone needs a locksmith it’s easy to find a locksmith. There are plenty of locksmith advertising in every media in existence. You can find a locksmith in your local directory pages and you can find a locksmith online in search engines like Google, Bing, Yahoo. Locksmith are like taxis cabs there are just too many and that makes it difficult to find a locksmith that you can trust. Here in Florida there is no regulation for locksmith like there is for electricians and HVAC technicians. In Florida you can put couple screwdrivers in you back pocket go online create a corporation with a locksmith name on it and become a locksmith business, it’s that easy. 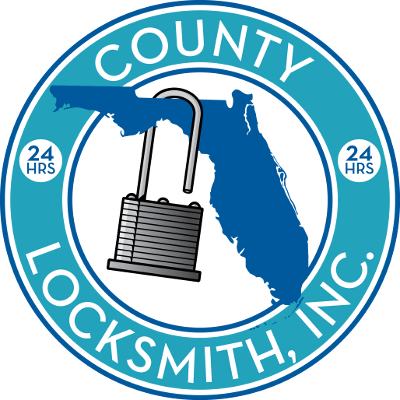 At County Locksmith Inc. we have over 32 years of combined experience and knowledge as locksmiths. Customer satisfaction is our #1 priority and we strive to maintain that status. If you need a reliable locksmith please bookmark our website and add our phone number to your address book. We give our customers 1 full year of parts and labor on all installation when most locksmith only give 90 day warranty. We have an online store that can match and even beat other online retailers at prices. If you buy from our store and we provide the installation (for local service only) our one year full warranty with parts and labor applies. If you buy online from any store and call a locksmith for installation that locksmith will not provide warranty. You will have to pay another trip charge and labor and parts to have the locksmith repair or replace if you lock malfunction. Not with us if you buy from our online store. We have combines 30+ years of experience in technicians. You will get a professional technician at you place. You don’t need to find your invoice for warranty, we have that on record for you. Other locksmith companies require you to have invoice for any warranty. That’s an old school tactic because chances are you will not find that invoice. We answer our phone. We do not use automated system or answering service, A real locksmith will personally answer the phone 24/7.